I am often asked about the difference between prayer and meditation. The distinction is not always obvious, and there are many misconceptions regarding both practices. Many people distinguish between meditation and prayer based on their physical postures. They imagine meditation as sitting quietly with one’s legs crossed, and prayer as kneeling with one’s hands folded. While these postures do have both practical and traditional reasons for being used, they are not essential to either spiritual practice. The true difference between meditation and prayer is not external, but internal. 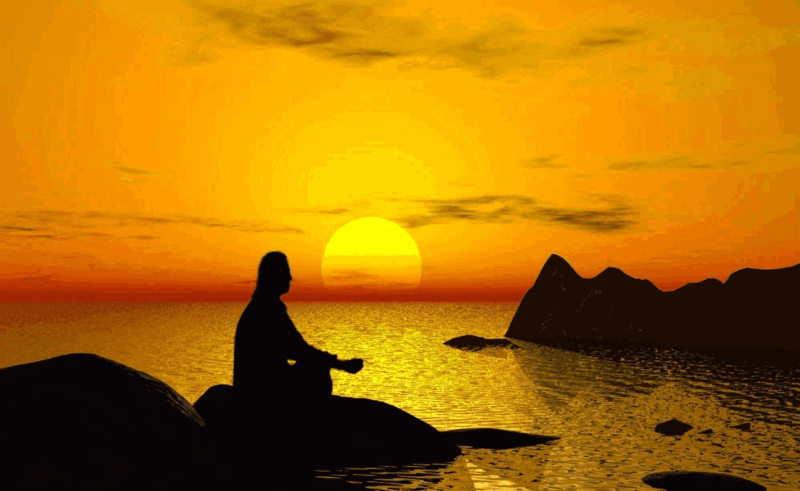 Meditation is commonly described as a focusing of one’s mind or making the mind one-pointed. This is often achieved by concentrating on the breath, a repeated phrase (known as a mantra), or an object (such as a candle). It is a withdrawing inwards from the outer world of the senses. In the beginning, one simply notices the activity of the mind, which is always thinking or oscillating between past events and worries about the future. During meditation, thoughts are observed without trying to judge or control them. As meditation deepens, one often feels detached from thoughts and sensory experiences, as if they can just flow by like a river without interference. Advanced meditation becomes effortless; one is naturally pulled inwards towards a great inner silence. Prayer is very different in that it attempts to use one’s thoughts and will to compassionately influence the outer world. In prayer, one starts with a separate sense of self that longs for help from a higher being – often God, the universe, one’s divine nature, Brahman, etc. – to change the world or a situation as they would like it to be. Whereas meditation generally involves removing judgment from one’s thoughts and ideas, prayer involves distinguishing between the positive and the negative and pleading for what is good or virtuous while rejecting what is bad or evil. After praying, people often report feeling more connected, calmer, and closer to God. Prayer uplifts the sense of separate self and brings the person into a feeling of unity. Meditation is generally practiced to better understand one’s perspective of the external world by coming into contact with the conditioned patterns of the mind. Prayer is generally practiced to change something unpleasant or intolerable in the external world. One does not need to have an objective to meditate; it is simply the practice of watching the mind, the breath or concentrating on a phrase or object. There are many reasons one might pray, but usually these reasons center around the need to beseech help from a higher power, and therefore relieve a sense of helplessness. When we pray wholeheartedly, beseeching God/higher power for help, our prayer itself brings us to a place of vulnerable openheartedness and connection. The same resting in presence and the falling away of the small self that happens in meditation can be the outcome of sincere prayer. Whichever you choose, starting your day with a short daily practice of prayer or meditation will change your outlook on life in surprising and unpredictable ways. Even if your prayer is a simple expression of gratitude or your meditation is a quick ten minutes of following the breath, consistent practice will produce tangible results.